Susan Anglada Bartley, 9781944733506, 256pp. A Different Vision: A Revolution Against Racism in Public Education, offers a vision for the radical transformation of public education in the United States. 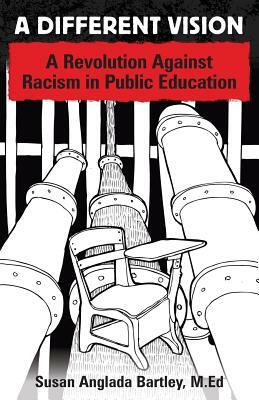 This text is designed for educators, district leaders, administrators, professors, parents, and community members who are concerned about systemic racism in public education. It demonstrates the ways in which white supremacy is perpetuated at the institutional and classroom levels, providing an alternative vision for U.S. schools. The book acknowledges the reality that 82% of U.S. educators are white. It challenges readers to examine how racism is perpetuated in our district offices, schools, assessment systems, and classrooms. It demands the inclusion of more educators of color in service of our diverse student populations. The text invites readers to employ a new set of strategies, at the administrative, teacher, union, and community levels, to revolutionize public education with the goal of greater social equality. SUSAN ANGLADA BARTLEY is a writer, educator, activist, and organizer living in Portland, Oregon. She was awarded the National Education Association H. Councill Trenholm Human and Civil Rights Award in 2013 and the OnPoint Community Credit Union Award for Excellence in Education in 2014. Her articles can be found at NEA Today; NEA EdVotes, Hampton Institute: A Working Class Think Tank, Latino Rebels, and on Medium.